While I was enjoying experimenting with the Thai spicy peanut sauce last week I realized that it reminded me a lot of a Mexican mole sauce and that thought gave me an idea. 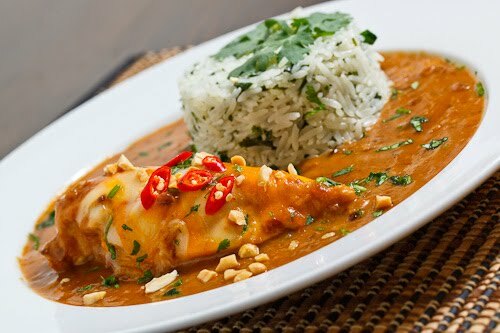 Why not a Thai spicy peanut sauce chicken ‘mole’? And with that, this super easy and tasty Thai chicken ‘mole’ recipe was born. This recipe is as simple as simmering the chicken in the peanut sauce and some chicken stock until cooked and then garnishing it in some melted jack and cheddar cheese, chopped peanuts and cilantro. Despite being so simple, this chicken mole is really good! You really can’t go wrong when you start off with an amazing spicy peanut sauce and cooking the chicken in it like this resulted in some of the moistest and juiciest chicken that I have ever had. I served the Thai chicken mole with some cilantro and lime rice where I replaced the water with coconut milk to make a coconut cilantro and lime rice. Mix the peanut sauce and chicken stock in a pan and bring to a boil. Reduce the heat, add the chicken, cover in the sauce and simmer, covered, for 30 minutes. Sprinkle the cheese onto the chicken, cover and cook until it melts, a few minutes. Serve garnished with fresh chopped cilantro, peanuts and chilies. I adore both mole and Thai food so the combination of the two is basically blowing my mind right now! This looks absolutely amazing. Superbe Yummy!!!! I love that idea! 🙂 Thank you for sharing a lovely combination! A delicious dish! What an amazing combination. Chicken mole – what's not to like?? Oooo – such a fun twist on otherwise standard fare! that`s absolutely yummy! I love the colour of that! Very interesting! My peanut sauce loving fiance would love this. Might have to give it a go. fabulous combo kevin! love the use of a thai-infusion whenever i can. Wow. This one has left me speechless… it looks amazing Kevin. This sounds right up my alley! I am continually inspired by your recipes and how you fuse different cuisines. This sounds crazy to me now but I've never had mole before! I'm slightly embarrassed to admit that. This looks so delicious. I'm always looking for new Asian dishes to try out and your blog never disappoints! A definite keeper….I've not had mole either! LOL. This may be a reason to try it. What a great way to infuse Mexican and Thai cuisines — I never would've thought to combine the two. Very creative. Kevin, that looks absolutely delicious! Your beautiful photography doesn't hurt the cause either. Nice work! Looks delicious Kevin. The photo really caught my eye on TS. Interesting meld of Thai and Mexican. And you are right – you cannot go wrong when you start with a spicy peanut sauce. If it was below 90 degrees, I'd be heating up the stove. Just made this for dinner, and it is absolutely delicious! The chicken really does cook perfectly in the spicy peanut sauce, and it is easy to make. Definitely making this again. Your creativity with food is great! You come up with some amazing dishes!